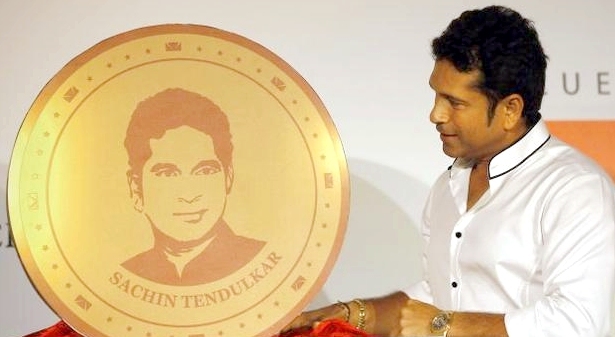 It refers to gold-coins issued by a private company with photo of cricket-icon Sachin Tendulkar embossed on high-priced gold-coins priced at rupees 34000 for ten-gms pure-gold coin, at a time when gold-prices are zooming around rupees 28000 per gms or so. Reserve bank of India (RBI) and Union Finance Ministry should take immediate steps to stop sale of such profit-making gold-coins. Sale of gold and silver coins marketed by banks, private firms and even government-agency like MMTC increases tremendously during festive season. Gold and silver coins issued in British regime are available in plenty as duplicates because of their popularity as auspicious and gift items even though fabrication of fake gold and silver coins is crime. Union government should take steps to counter the menace. Reserve Bank of India (RBI) can issue official 24-carrat gold in Rs 20000 denominations with weight of 5 gms. To minimise chances of duplication, these coins should be numbered. A guarantee-certificate bearing number of the coin and security thread should be plastic-sealed with each coin mentioning weight and purity as attractive gift-items. Face value of coins can be increased after value of gold in coin crosses seventy percent of prevailing face value of the coin. Only RBI should be authorised to issue round-shaped gold and silver coins to be easily available through all branches of public-sector banks and post-offices. Likewise pure silver coins of 10 gms can be issued in denomination of Rs 1000. System will be net revenue earning for Government because suggested plastic-packed coins will never come in actual circulation. All these coins should be made conveniently available in plenty at all offices of RBI and bank-branches throughout the country. These coins can also be issued to commemorate occasions. Once RBI starts issuing gold and silver coins, sale of gold and silver by private establishments in form of coins can be banned. However sale of metal may be allowed by banks and others in rectangular or square form.